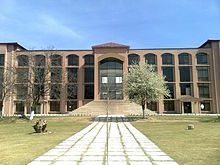 The city is well known throughout Pakistan for its pleasant weather, high-standard educational institutions and for hosting the Pakistan Military Academy in Kakul. It remains a popular hill station attracting hundreds of thousands of tourists every year. 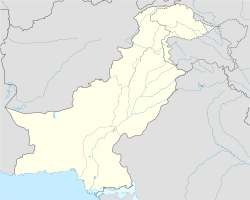 Outside of Pakistan, it is best known as the place where Osama bin Laden was killed. A shot during winter 2012. The city is bounded at all four sides by the Sarban hills, from which residents and tourists can view the region and city. 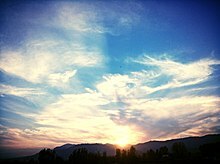 The location of the city and the hills allows Abbottabad to experience pleasant weather in the summer and cold winters. The Dor river flows south of Abbottabad through the town of Harnol, eventually reaching Tarbela Dam, west of Abbottabad. Neighbouring districts are Mansehra to the north, Muzaffarabad to the east, Haripur to the west and Islamabad Capital Territory to the south. 'Harnoi', a famous picnic spot 10 km from city. Abbottabad's main public transport consists of modified taxis: pick-up Suzuki vans, which can accommodate anywhere from 1 to 14 people at one time. Taxis are available as well as wagons that connect Abbottabad to surrounding cities and towns (ex. Nawanshahr, Nathiagali, Sherwan, Dhamtour, Haripur, Mansehra) in the region. ^ "POPULATION AND HOUSEHOLD DETAIL FROM BLOCK TO DISTRICT LEVEL: KHYBER PAKHTUNKHWA (ABBOTTABAD DISTRICT)" (PDF). Pakistan Bureau of Statistics. 2018-01-03. Retrieved 2018-04-17. ^ "Harnoi — gateway to Galyat". The Express Tribune. Muhammad Sadaqat. Retrieved 7 June 2015. ^ "Alif Ailaan Pakistan District Education Rankings, 2014" (PDF). Alif Ailaan. Retrieved 2014-05-06. ^ "Individual district profile link, 2014" (PDF). Alif Ailaan. Retrieved 2014-05-06.